After a long day of meetings, Gagit and San Diego were too tired to go to D.O.M., but Braz Pizza is one of the best in Brazil and supposedly a great way to unwind. We get to Braz and as expected there was a half hour wait in this huge restaurant. This wasn't so bad, considering how popular the place is. Once seated, we ordered a house special Chopp, and a Brahma Black, which is a real beer that tastes more like Root Beer than Guinness, yet has a smooth and light flavor. We were hungry and found a starter that will keep us going until we are seated. We chose Linquica on Skewers with Onion, shown above and perfectly cooked in the wood oven. We were finally seated and our server Enzo, gets me another Chopp and San Diego a Caipirinha, as we study the huge Pizza menu and really want to try them all. 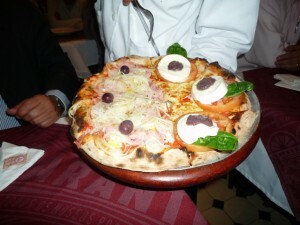 We make our ultimate choice, which was a medium pizza, 6 slices of two different combinations. Half Caprese, fresh Mozzarella, Tomatoes, a special Black Olive Spread with Basil & half Portuguesa, Ham, Egg, and Onion. We also had Olives, all over a Tomato and Cheese base shown in full splendor above. Enzo serves each of us with a smile and covers the Pizza until we ask for another piece. He also brings over as shown , hot Olive Oil, red Peppers, and hot spicy fresh Peppers. This is a serious Pizza restaurant. We devour this Pizza, enjoying every bite and leave the restaurant, passing by the Pizza staff and ovens with a obrigado (thanks). Braz Pizza gets 7 out of 8 slices!